Reversing the conventional process of creating new drugs, Vanderbilt University researchers have used an alternative approach called bioretrosynthesis to produce the expensive HIV drug didanosine. Some background: normally, both evolution and synthetic chemistry proceed from the simple to the complex. Small molecules are combined and modified to make larger and more complex molecules that perform specific functions. Bioretrosynthesis works in the opposite direction, says Bachmann: it starts with the final, desired product and then uses natural selection to produce a series of specialized enzymes that can make the final product out of a chain of chemical reactions — reactions that begin with simple, commonly available (read: cheap) compounds. Bachmann got the idea of applying natural selection in reverse from the retro-evolution hypothesis proposed in 1945 by the late Caltech geneticist Norman Horowitz. Think of an early stage in the development of life, where early organisms are swimming in a primordial soup rich in organic material. Now imagine that one of the species finds a use for a complex chemical compound called A that gives it a competitive advantage. As a result, its population expands, consuming more and more compound A. Everything goes well until oops, compound A becomes scarce. But then some individuals develop an enzyme that allows them to substitute the still plentiful compound B for the scarce compound A. They gain a reproductive advantage and continue to grow, while those who remain dependent on compound A die out. And so it goes until many generations later, the survivors have developed multi-step chemical pathways to produce the molecules that they need to survive from the molecules available in their environment. But would this process work for creating a modern drug? Bachmann and his team decided to test that by trying to produce didanosine, an anti-HIV drug sold under the trade names of Videx and Videx EC that is very costly to manufacture. The details of this proof-of-concept experiment are described in a paper published online March 23 by the journal Nature Chemical Biology, but here’s a summary. The researchers identified a similar “precursor” molecule that can be converted into didanosine when it is subject to a specific chemical transformation along with an enzyme capable of producing the type of transformation required. Once they identified that enzyme, they made use of the power of natural selection by making thousands of copies of the gene that makes that enzyme, using a special copying technique that introduces random mutations. After the cells were broken open and the contents mixed with the precursor compound, the amount of didanosine in each well was measured. The researchers selected the enzyme that produced the greatest amount of the desired drug and then made enough of this optimized enzyme for the next step. Next the researchers identified a second precursor — an even simpler molecule that could be chemical converted into the first precursor — and an associated transformative enzyme. Again they made thousands of mutated versions of the transformative enzyme’s gene, inserted them in E. coli, put them in wells, broke open the cells and mixed the content with the optimized enzyme and second precursor. Once again, they tested all the wells for the anti-HIV drug. 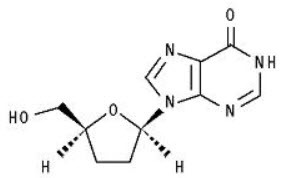 The well with the highest level of didanosine was the one in which the mutant enzyme was most effective in making the first precursor, which the optimized enzyme then converted into didanosine. This gave them a second optimized enzyme. The researchers carried out this reverse selection process three times, until voilà: they could make didanosine out a simple and inexpensive sugar named dideoxyribose. 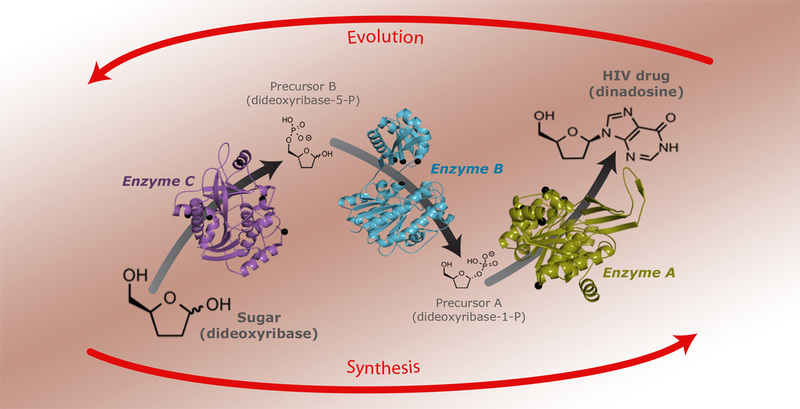 One of the key technical challenges was rapidly determining the three-dimensional structures of the enzymes that were generated during the evolutionary process. Associate Professor of Pharmacology Tina Iverson provided this capability. Her team analyzed the laboratory-evolved enzymes after each round of mutagenesis and identified how the structural changes caused by the mutations improved the enzyme’s ability to produce the desired transformation. This information helped the collaborators figure out why some mutant enzymes did a better job at producing the desired compounds than others, which guided their choices about the areas of the precursor proteins to target. In addition to drugs, bioretrosynthesis is “an innovation in the burgeoning field of synthetic biology that can revolutionize how we engineer microorganisms to produce synthetic chemicals of value to humanity, including fine chemicals and materials,” Bachmann explained to KurzweilAI in an email interview. The research was supported by a National Science Foundation graduate fellowship, the D. Stanley and Ann T. Tarbell Endowment fund, National Institutes of Health, and Department of Energy Argonne National Laboratory. Concatenation of engineered biocatalysts into multistep pathways markedly increases their utility, but the development of generalizable assembly methods remains a major challenge. Herein we evaluate ‘bioretrosynthesis’, which is an application of the retrograde evolution hypothesis, for biosynthetic pathway construction. To test bioretrosynthesis, we engineered a pathway for synthesis of the antiretroviral nucleoside analog didanosine (2′,3′-dideoxyinosine). Applying both directed evolution — and structure-based approaches, we began pathway construction with a retro-extension from an engineered purine nucleoside phosphorylase and evolved 1,5-phosphopentomutase to accept the substrate 2,3-dideoxyribose 5-phosphate with a 700-fold change in substrate selectivity and threefold increased turnover in cell lysate. A subsequent retrograde pathway extension, via ribokinase engineering, resulted in a didanosine pathway with a 9,500-fold change in nucleoside production selectivity and 50-fold increase in didanosine production. Unexpectedly, the result of this bioretrosynthetic step was not a retro-extension from phosphopentomutase but rather the discovery of a fortuitous pathway-shortening bypass via the engineered ribokinase.